All right… I used to date Melanie who worked overnights on Rock 92 close to 20 years ago. I got to meet and hang out with all the other jocks and they never once called security on me. Pete Bunch (long time Rock 92 jock and all around great guy) has always been a hard rocking kind of guy. And when he was working in Buffalo, New York… He did an interview with Gene Simmons of KISS. Perhaps I’m a little fuzzy with the details, but this is the best memory that I have… Gene liked him so much that he enlisted Pete into an exclusive KISS Klub. When he wanted to see KISS, he would call the 800 number on the back of the card given to him. They would ask him where and when he wanted to see KISS… He was set up with 2 tickets and 2 backstage passes. Pete knew that I was a HUGE KISS fan and he told me that when they were coming to Greensboro on the ‘Hot In The Shade’ Tour, he was taking me backstage. To say the least, I was thrilled. I was finally going to meet my “rock gods”. During that week, Melanie’s 14-year-old sister Anna was in Greensboro (she lived in Knoxville) for a visit. And as it turned out, Anna had never been to a rock concert before. Melanie had MANY tickets to spare and suggested that I take Anna to the show. Hmmmm… Anna’s first concert… KISS… It would be a memory that she would keep forever and I would be a part of something that she would always remember. There was no question about it… I HAD to take Anna to this show! I never factored in that I would be going backstage to meet KISS. So Pete showed up with Scott Gentle (also of Rock 92) and it was time to go backstage. Something kicked in… She didn’t know Scott and I didn’t feel comfortable leaving her with a Coliseum filled with strangers in Greensboro. Sure, I trusted Scott, but Anna was in my care and for some reason my “responsible gene” took over my mind and body. I passed up my opportunity to meet KISS backstage to make sure Anna was being looked after. I didn’t even have one beer that night. I was taking it all very seriously. I wasn’t going to let Anna or Melanie down. So Pete and Scott headed backstage after a few “are you sure’s”… I was very sure. The cool thing… Scott brought me back a poster that was signed by Bruce Kulick and Eric Carr! I was thrilled, but I couldn’t help but ask where Gene and Paul’s signatures were. Their Hancock’s weren’t on the poster. Scott told me things that the most diehard KISS fan didn’t want to hear… While Bruce and Eric were being cool, meeting all the fans and signing autographs… Gene was feeling up every women in the backstage area even if their boyfriends/husbands were standing right there! And Paul was being the “don’t touch me - I’m a rock star” with a kind of prima donna type of attitude. He simply couldn’t be bothered. Gene and Paul weren’t signing any autographs unless you had two bulbous matching sets of mammary glands. That news really kinda pissed me off… I’m so very sure that if I had actually witnessed this for myself, I would have looked at KISS in a very different way. I may have even ditched all my LP’s and CD’s. So in a sense… Hanging with Anna was not only the right thing to do, it was also something that kept me in the KISS fold. And it wasn’t too long after that when Eric Carr died on an operating table the same day that Freddie Mercury from Queen died. He didn’t even get a mention in Rolling Stone magazine to which Gene and Paul wrote a scathing letter to the Editor. 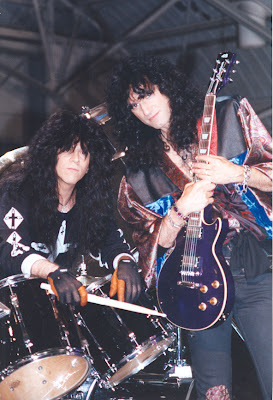 In my opinion, Eric Carr was one of the greatest hard rock drummers ever to step behind a kit. Usually, I would venture out to the bathrooms during drum solos, but not with Eric Carr or Tommy Lee (Motley Crue). Feel free to read all about him.